Sprinkle a little fairy dust with this Tinker Bell pendant from Disney. 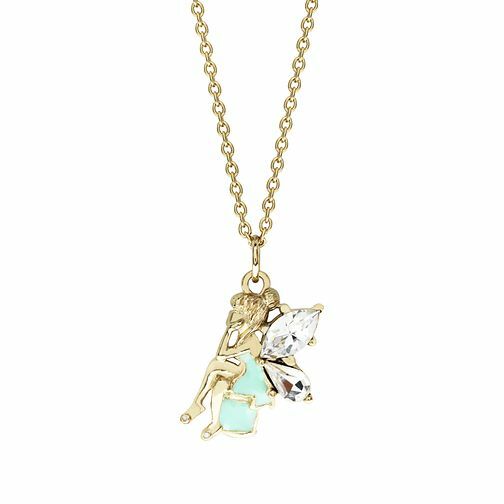 Designed in gold plated sterling silver, the adorable Tinker Bell is decorated with clear crystal wings and a light teal enamel dress. This pendant is the perfect gift for any budding princess. Set on a 14 inch gold plated sterling silver link chain with a 2 inch extension, this pendant is suitable for children, teens and young adults alike. This design is exclusive to H.Samuel and each piece comes with its own beautiful Tinker Bell gift box. Disney Children's Tinker Bell Gold Plated Crystal Pendant is rated 5.0 out of 5 by 2. Rated 5 out of 5 by Anonymous from Very Pleased Bought for my niece for her 5th birthday, she loves it and hasnt taken it off since! Even been showing all her friends at school.